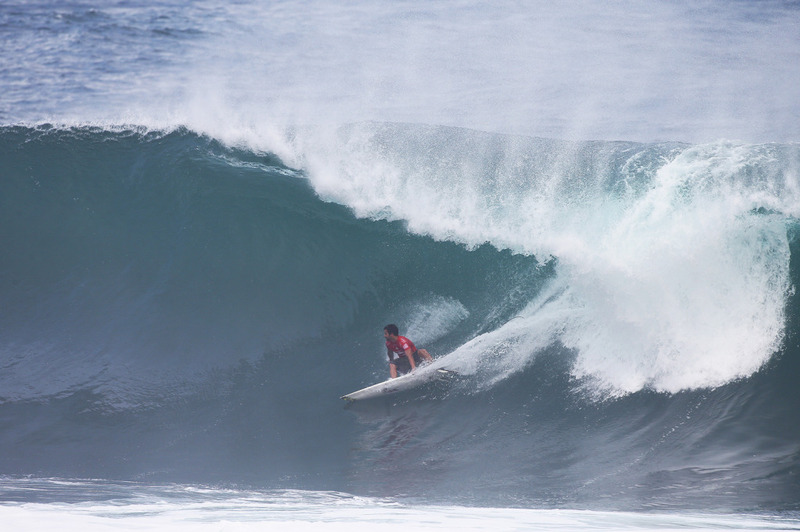 Pipeline, Hawaii- The final stop of the Samsung Galaxy WSL Men’s Championship Tour and Vans Triple Crown of Surfing, the Billabong Pipe Masters In Memory of Andy Irons, completed the opening round of competition today in shifting eight-to-ten foot Banzai Pipeline conditions. With strong winds consistent throughout the day and a predominant North swell on offer, Round 1 had moments of brilliance amidst unruly rip currents sweeping the lineup as the world’s best tackled the world’s most notorious wave. Italo Ferrari was an early standout, proving its not just beachies he excels in, landing himself one of the highest heat totals of the day with a masterful performance on both his fore and backhands. C.J. Hobgood (USA), who announced 2015 would be his retirement season earlier in the year, enters the final event of his pro career here at Pipeline, and the Floridian came out swinging in Heat 9 alongside Taj Burrow (AUS) and 11-time WSL Champion Kelly Slater (USA). Hobgood began his 2015 Pipeline campaign with a Perfect 10, finding a near-impossible exit that had the crowd on their feet en route to earning the highest heat total of 14.97. Following Owen Wright’s (AUS) withdrawal from competition earlier this morning, the 2015 World Title is now down to five contenders here at Pipeline. Leading the charge is Mick Fanning (AUS) who weathered the storm of 2001 Pipe Master Bruce Irons (HAW) and Sebastian Zietz (HAW) with a 9.43 that earned the Jeep Rankings’ Leader a Round 1 victory. 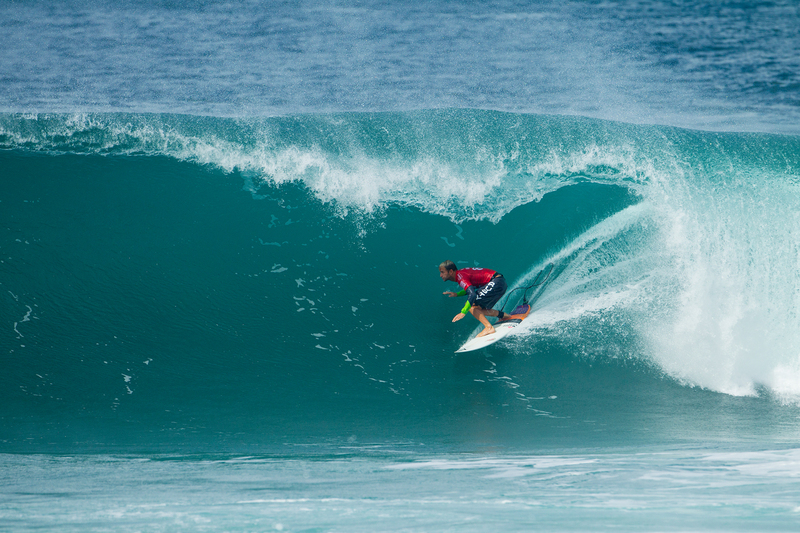 “I was pretty nervous coming up against Bruce and Seabass, they’re some of the best surfers in the world – especially here at Pipeline and I just love both of them,” Fanning said. “We started off so quick and the nerves didn’t really set in once we were in the water but I was stoked to get two quick ones. The next twenty minutes was pretty nerve-racking just because Bruce is capable of anything. Also earning a Round 3 berth with a victory over Keanu Asing (HAW) and Wade Carmichael (BRA) in Round 1, current World No.4 Gabriel Medina (BRA) increased his odds to earn back-to-back World Titles. Medina looked in-form and poses a serious threat to the Title race with a carefree approach knowing his chances are narrow. While Fanning and Medina are safely through to Round 3, World No.2 Filipe Toledo (BRA), No.3 Adriano De Souza (BRA) and No.7 Julian Wilson (AUS) all face elimination in Round 2 against formidable opponents. De Souza will face the Pipe Invitational Winner Jack Robinson (AUS) in Heat 3 and Wilson has to battle current Vans Triple Crown of Surfing ratings leader Wade Carmichael (AUS) in Heat 5. Up first, Toledo will be pitted against former Pipe Master Bruce Irons (HAW) in Heat 1, Round 2 when competition commences. Solid surf continues on Thursday as the current WNW swell trends more to the NW and strong E trades prevail. The surf fades through Friday as trades also ease. Small NW swell prevails over the weekend, with much lighter wind. Confidence is increasing that a strong NW swell will build in through the middle part of next week as trades also rebuild.